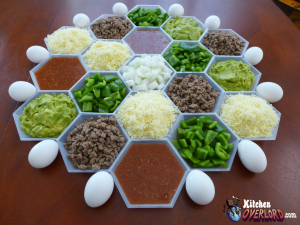 While I consider myself a gamer and have made my own gaming related foods in the past, Settlers of Catan is foreign territory for me. 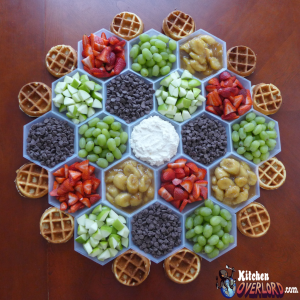 Had the reference not been listed specifically in their post, I probably would’ve just seen this as a really cool breakfast bar setup. Which it is. Game or no game, check out that setup! These were specifically built for brunch and an afternoon of gaming. Even the food choices involved are set to last for several hours set out (ie – hard boiled eggs instead scrambled eggs). The waffles are just for display purposes and Kitchen Overload recommends having the waffle iron left out for fresh waffle-making purposes….and possibly a skillet and butter for fresh scrambled eggs instead of the hard boiled option. For me, though, I just fell in love with those bowls, no matter how long the food is intended to be left out! I started imagining all the different food combinations I could put together into a buffet style spread for parties. Or heck, when there were 6 of us in the house and the kids brought over friends, that was the food equivalent of a party every other day, ha! So it could’ve been fun to have Hawaiian haystack toppings or taco night spreads in dishes like these. Ooo, or for pizza nights where I’d let everybody build their own topping combinations. 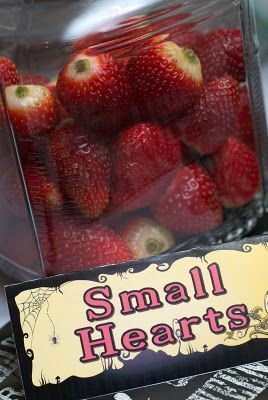 I’d definitely want the small ones for something like that, though (like shown in the one with jam/butter/cheese). And a sundae bar with all the fixins! And…. ok, you get the idea. My thoughts on them are endless. The best part is, they’re super cheap. 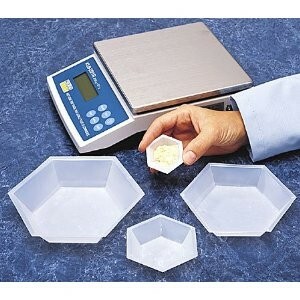 Instead of spending 12 bucks a pop on real dishes, they used weight boats that you’d find in a lab…..$16.95 for 100 of them! 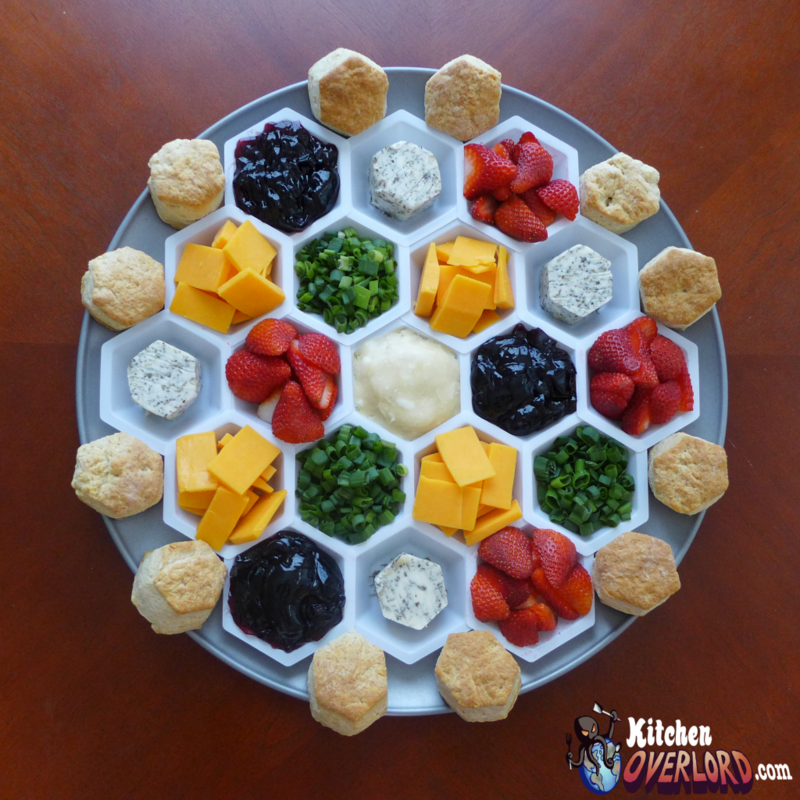 Yes, a hundred of them, so for an arrangement like the Catan board, you could have 5 different spreads (19 hexes per board) and just toss them out after each time without breaking the bank. That sure beats washing them, too. Click over to KO to see the breakdown of the sizes used/recommended (the medium one actually holds 2 full cups of goodies, so beware!). They’re going to be flimsy, but I think stacking them side-by-side might give them a bit more stability. So long as you’re careful, I don’t think it’d be a big deal anyway. What’s the worse that can happen? A few grapes spill out on the table? 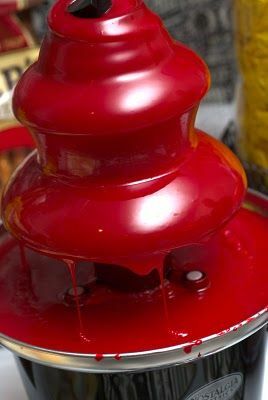 Or some salsa gets a little messy? Oh noes….it’s the end of the world! 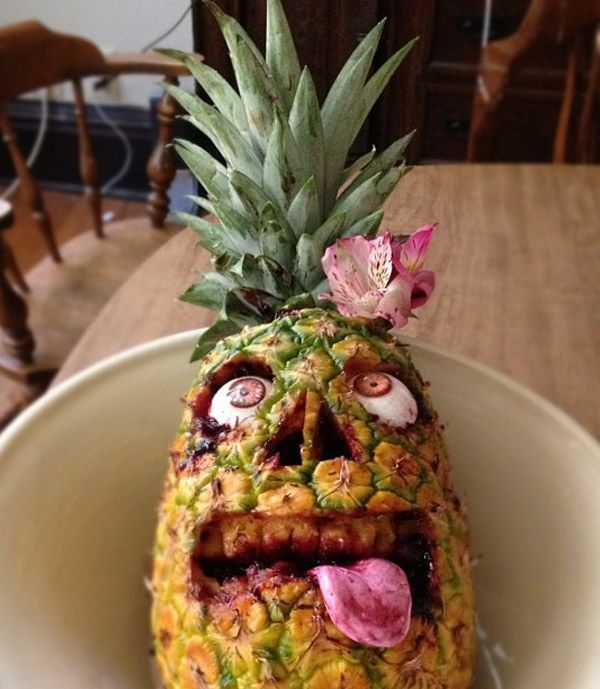 Then obviously this zombie pineapple is the perfect hostess gift. Or maybe it would be your +1? If you want some closeups of the teeth and tongue, definitely click here. Oh, and the eyes, too. Crepy! 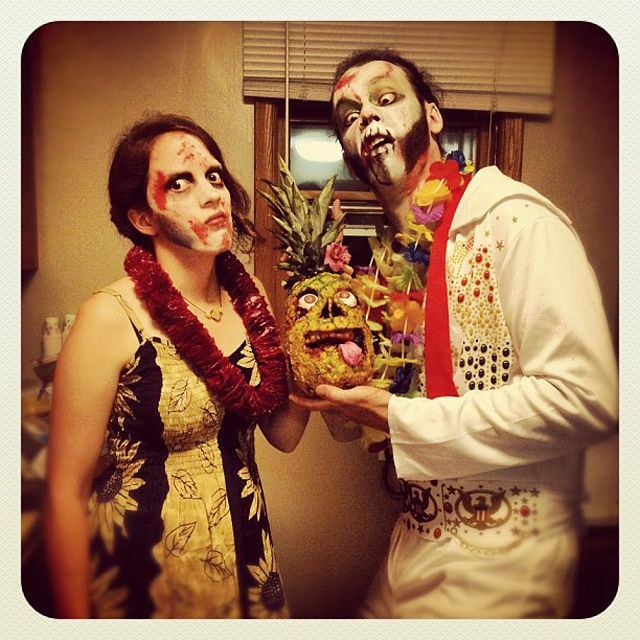 The eyes don’t appear to be edible and neither is the flower, that I know of, by the rest is. The tongue is actually laffy taffy candy and the “blood” is blackberry jam. Cool, isn’t it?